Walk Softly and Carry a Black Light! It’s that time of year in Arizona! Walk softly and carry a black light. Oh, wait a minute, that’s not how that old saying goes. 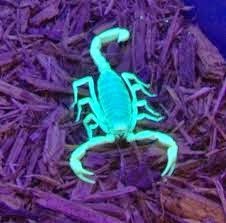 Well, black light is more effective than a big stick when it comes to scorpions. Two nights ago I walked to my bedroom and remembered I’d left a light on. As I turned to go back down the hall, I saw it! Just outside my bedroom door – all big and white and blending into the carpet with his ugly tail I knew would sting me in a second. I don’t know why, but I’m more terrified of scorpions than of rattlesnakes. I just freak out (which is not my nature). It’s ten o’clock and I’m walking in circles repeating what should I do? What should I do? If I go further down the hall to get to the bug spray, I risk walking over him and who knows if he will sense me and run right at me. Or worse, run forward and I step on the danged thing. I went to my closet and put on enclosed shoes, opened the bathroom linen closet to find something to place over it. I had one decent size plastic container that I use for tubes of ointments, etc. I emptied it quickly and raced back to make sure he hadn’t moved. I had to lower it slowly. The container now directly over him and just an inch or two above him, I held my breath and pushed downward. Success! I ran to the closet again and found a shoe box and placed that over the container over the scorpion. To the garage for bug spray. When I returned I realized that I had to take the box off and somehow lift the container enough to aim for him inside with a force of spray. I turned the sprayer nozzle to the ‘on’ position, aimed and lifted the container less than 1/8th of an inch and sprayed. I repeated this process a half dozen times. I could see him climbing up the walls of the almost clear container. I went for the black light so I could watch him die. I lifted the container one more time and sprayed enough chemical to kill me as well. Scorpions can make themselves so thin, they can go under anything, but I prayed. I pushed the round container into the carpet further; replaced the shoe box and placed the heavy bottle of bug spray on top. I wondered if he’d be there the next morning. I had coffee and woke up a bit before I checked. I carefully removed the bug spray, the shoe box and the then the container. With one hand I lifted it; with the other hand I sprayed like crazy onto its dead and lifeless body. They can look dead and suddenly run the other way. My carpet is now soaked with chemical, but I scooped his ugly body into the shoe box and raced to the bathroom. I flushed at least five times to make sure he went all the way into the sewer system.I sprayed the entire house inside and diatomaceous earth outside. My black light is on my night stand; enclosed shoes by the bed and I pray he’s the last of the season! This entry was posted in Uncategorized on April 28, 2015 by cwesala.